A little bird told me of an Upcoming Event in support of Edunation, a not-for-profit movement seeking to build a free educational ecosystem online for Malaysian students. Allan Perera, Malaysia’s much loved comedian, musician, artiste and philanthropist is back by popular demand with more giggles to share. 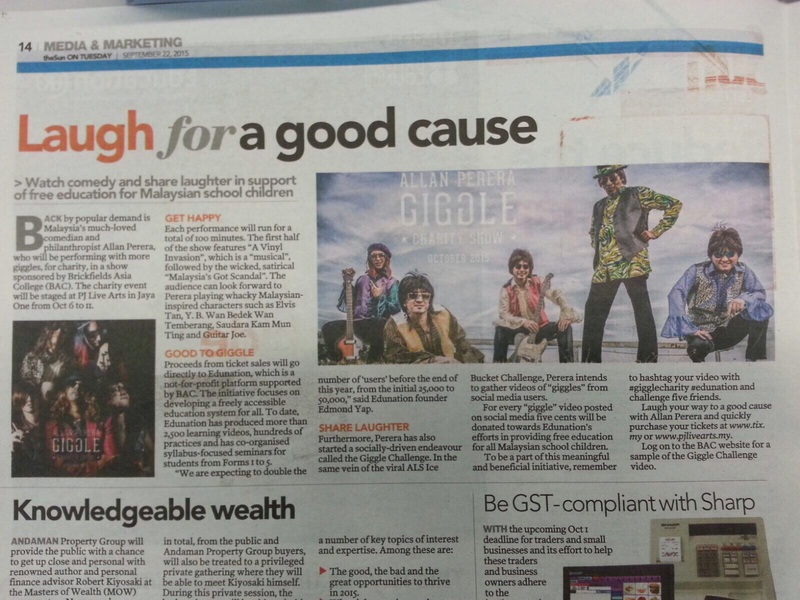 This charity show is sponsored by Brickfields Asia College (BAC) with all proceeds going to Edunation. The first half of the 100-minute show, A Vinyl Invasion, is a musical with the second half showcasing Perera’s wicked comedy satire “Malaysia’s Got Scandal”. This unique show features Allan playing many whacky Malaysian-inspired characters such as Elvis Tan, Y.B. Wan Bedek Wan Temberang, Saudara Kam Mun Ting and Guitar Joe. Perera’s return has given birth to a new initiative called the Giggle Challenge which is a social media driven, awareness and fund-raising gig similar to the virulent ALS Ice Bucket Challenge. The idea is to gather as many giggles as possible through social media with every giggle translating to a five (5) cents donation toward Edunation’s efforts to provide free education for all Malaysian school children. Edunation is a fast-growing and not-for-profit platform supported by Brickfields Asia College which focuses on developing a freely accessible education system for all. To date, Edunation has produced more than 2,500 learning videos, hundreds of practices and has co-organised syllabus-focused seminars for Form 1 to Form 5 students. “With the vast support we have from both donors and users, we are expecting to double the number of users before the end of the year; from the initial 25,000 to 50,000” said Edmond Yap, the founder of Edunation. There’s no better way to bring a person more joy than by sharing laughter. Share your laughter for a good cause! 1) Watch the show which runs from 6th to 11th October (8.30pm) at PJ Live Arts, Jaya One. 2) Participate in the Giggle Challenge. Make a video of you giggling, challenge five (5) of your friends via social media with hashtags #gigglecharity #edunation. Five (5) cents will be donated to Edunation for every giggle video submitted. Visit giggle.bac.edu.my for a sample video! 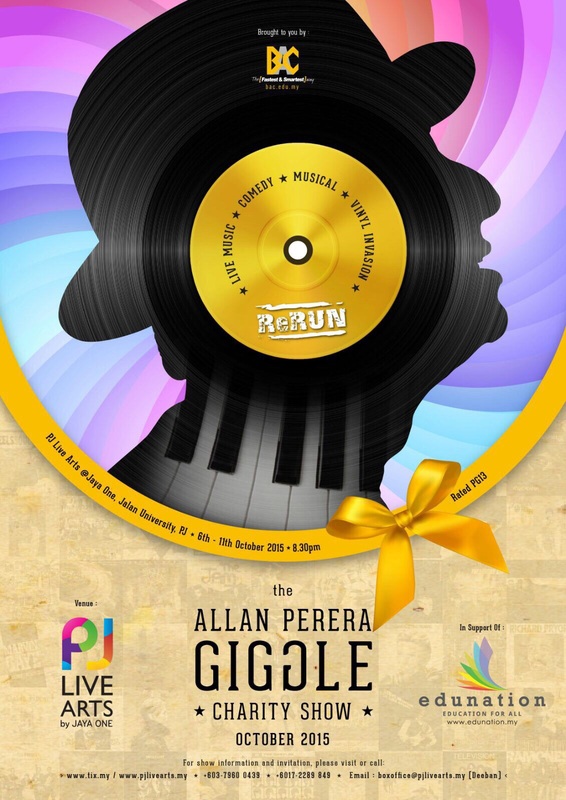 Back by popular demand, Allan Perera, Malaysia’s much loved comedian, musician and artiste brought more giggles to audiences from 6th to 11th October 2015. All proceeds were channeled to Edunation - the chosen non-profit movement of the year. An initiative devised by Allan Perera with the vision to create a global laughter movement that spreads from Malaysia to the world through the Giggle platform. Every laughter and joke collected with the hashtags (#giggleshow #gigglecharity #edunation) helped raise funds to provide free education and tuition for all. BAC is the corporate partner that helped make the Giggle Charity Show possible. Brickfields Asia College (BAC) has established itself as the Fastest & Smartest Way to UK Law & Business degrees. The college has established an excellent reputation as a provider of quality education and its graduates are highly sought after by local and international firms in both the public and private sectors; with more than 25 foreign universities and professional organisations, offering its students access to over 100 world-class Law and Business degrees and professional qualifications that can be completed either locally or abroad. The chosen beneficiary of the year. EduNation is a not-for-profit movement seeking to make Malaysian education better. Our efforts are heavily invested in building a free educational ecosystem online with more than 2,500 learning videos, hundreds of practices and exercises featuring all 12 core subjects in the high school syllabus. Also, building the “Teacher’s Community of Practice”- a social platform to help educators connect, innovate, provide peer support and recognition.